Uber now operates in 311 cities in 58 countries, providing more than 1m rides each day. 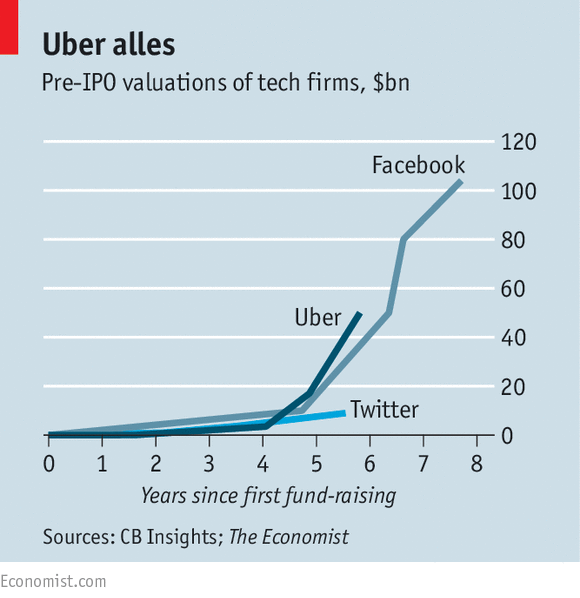 Uber’s value has grown faster than those of Facebook and Twitter in their early years. But Uber should also be admired by strategists in other industries. It is a case study in how to construct a “platform”, a Silicon Valley buzzword for a digital service on top of which other businesses can be built. (Omit) Google’s mission is to organise all the world’s information; Uber’s is to offer “transportation as reliable as running water, everywhere for everyone”. Last month Toronto became the fifth city where the firm’s lunch-delivery service, UberEATS (pictured), is available. (omit)In some cities there are already a number of smaller firms that offer rapid dispatch via an app: for instance, Instacart delivers groceries, Postmates brings hot meals and Shyp collects parcels. Logistics companies have invested heavily in algorithms that help them route deliveries efficiently; but as Uber’s traffic grows, and as it spreads to more places, it will gather a wealth of data that will let it catch up with them.